In a world with 31 billion devices already connected to the Internet, and a seemingly unstoppable march towards connecting everything and everyone, the DDoS attack surface is becoming practically infinite. Complex BotNets that recruit all types of IoT devices are leading to DDoS attacks nearing the 2Tbps mark, with no limit in sight. While there are a limited number of service providers that need to worry about mitigating a 2Tbps attack today, there is a new set of regulations (GDPR) requiring companies to guarantee security and availability, and GDPR will apply to companies of all sizes. How can enterprises and service providers embrace this change and make the best of it? 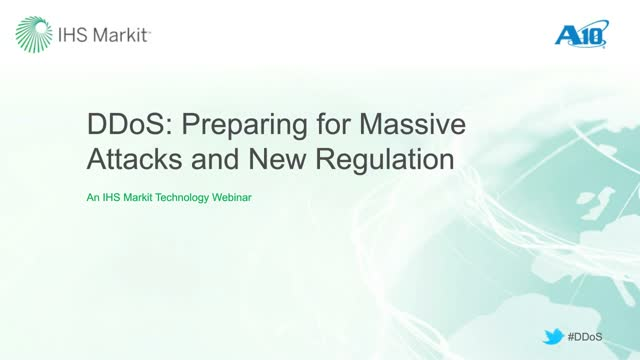 This webinar will explore how companies worried about the confluence of massive DDoS attacks and new regulations can seize this opportunity to re-imagine their DDoS mitigation infrastructure.